March has literally flown by in wind gusts and rainstorms. It seems this year is getting away from us, and as we barrel toward Easter Weekend, this fast pace is catching up with me! In ministry, as in life, I find myself needing to take time to catch my breath. In my role as Children’s Pastor to 300 kids and families, I find that if I don’t stop and catch my breath, I will get bowled over, stressed out, and physically sick. And that is certainly not how I want to step into the most important time of the year, when we get to celebrate the whole reason we are followers of Jesus…and when we potentially see more people coming to church than any other Sunday for the rest of the year. So, what should you do when life seems to be constantly busy and you need a minute? Point your eyes on Jesus. Of course! Jesus did the work that He needed to do and then He secluded Himself and prayed. Jesus didn’t just pray a quick 5-minute prayer in the midst of His To Do List. The scripture says He went up on the mountain to pray and He was still there alone well into the evening. Many times in Jesus’ time on earth, He could be found seeking God in prayer, alone. The thing I love is that no matter what part of the day, no matter how busy His schedule was, Jesus took time away, alone, to pray. This really challenges me, because as much as I spend time in prayer with God, I have to stop and think about time I seclude myself and pray. Where is my private mountain? Where is my secluded place? To be honest, sometimes it is in my car, either parked in my garage or surrounded by standstill traffic on the 101. Or sometimes it is at my kitchen sink or in the bathtub. More times than not, as a Pastor, I find myself praying over the phone, in coffee shops, in people’s homes and hospital rooms, over baby cribs, and with other people. All of those things are not bad – praying with people and spending time with God is a good thing. But for the rest of the month, I’m going to take a lesson from Jesus and seclude myself to pray. I want to sit in the quiet and approach God alone. This way, I can continue to do the things He has asked me to do. I can rely on His strength and not my own. I can celebrate His death and resurrection in awe and wonder without rushing or stress. I believe that deepening my alone time with God in prayer will reveal the greater purposes of my life here on earth. And that through this relationship with Him, I will come to know Him more intimately and begin to understand all that awaits in Heaven. I challenge you to find secluded time to pray. I encourage you to be still and quiet, and listen for His voice. Easter preparations can wait. God wants us to honor Him and we can’t do that in the hustle and bustle of life. We have to stop sometimes and wait. Don’t just do something, stand there. Be with God. 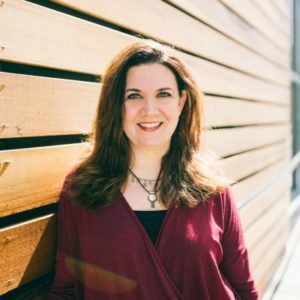 Born in Texas and raised in Louisiana, Lori Ann Piscioneri has the pleasure to serve as the Kids Pastor at Oasis Church in Los Angeles, located in the middle of the most populated part of the city – Koreatown. Oasis is a culturally diverse church with contemporary services and relevant teaching for people of all ages. Having grown up in church, Lori Ann was first drawn to serve in Kids ministry at Oasis in 2010, and became Kids Pastor in 2013. She is a professional opera singer and voice teacher and believes God placed her in Kids to help them build their faith and discover their gifts and talents. Lori Ann and her husband Mike “Pish” serve together, building up disciples for Christ not only in Kids but as Connect Group Leaders and mentors for young adults and couples in Los Angeles. They write, produce, and perform in exciting and creative curriculum for Kids ages 2 – 12.